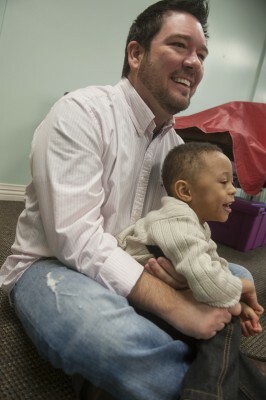 Eric Grossman ’15 participates in a playgroup program that LC special education students organized at a local preschool. After finishing University of Lynchburg’s special education teacher program last year, Eric Grossman ’15 received 26 job offers. Now he is teaching special education at a Lynchburg School. This week, the News & Advance highlighted his efforts in and out of the classroom, including his initiative to teach important life skills to boys who need a positive example. In the article, Eric talks about how his education at LC prepared him to have concern for all students, allowing him to help students with special needs grasp general education curriculum. An Air Force veteran, Eric had a full plate in college: he worked to support his family, coached high school soccer, and completed his undergraduate degree at the same time. After winning money through a campus leadership award last year, he donated the cash to the Challenged Sports Exchange to start a soccer program for athletes with disabilities. Read the News & Advance story here.